Interactive Fact Folders have been a game changer in my classroom during social studies and science time. I am always looking for good ways to integrate these areas with reading and writing, and these Fact Folders have done just that. 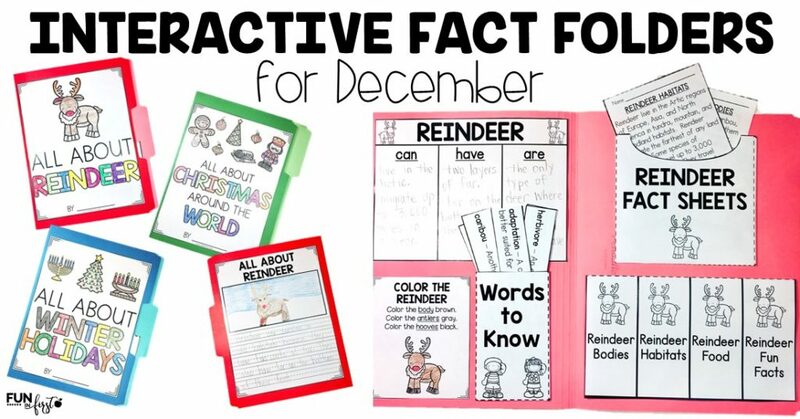 These Interactive Fact Folder can be made on file folders or a 12×18 piece of folded construction paper. To save money, I always use construction paper with my students. 24 pieces of construction paper is more cost-effective than 24 file folders. Each folder comes with a cover page, graphic organizers, 4 fact sheets, a color section, vocabulary words, and writing pages. Day 1: Pass out the cover page and 12×18 folded piece of construction paper. Students color the front page, cut out along the black line and glue to the front of their folders. Day 2: Pass out the Fact Sheet Pocket and their folders. Students cut and glue their pocket together. Then, they glue it into the inside of their Fact Folder. Pass out the Fact Sheet Graphic Organizer. Students cut it out, fold it in half, and glue it under their Fact Sheet Pocket. Then, they take their scissors and cut up along the dotted lines. Pass out the first fact sheet to read. I read this to the class first. Then, I have them highlight any vocabulary words or important facts that I would like for them to remember. Next, the students flip up the first portion of the graphic organizer and write something they learned from the Fact Sheet. Day 3: Pass out the folders and another Fact Sheet. Follow the same procedure as yesterday. Pass out the Color Page and Words to Know pocket. Have the students cut out the items and add them to their fact folders. Day 4: Pass out the folders and the last two Fact Sheets. Follow the same procedure as the days before. Pass out the final graphic organizer for the top of the inside. 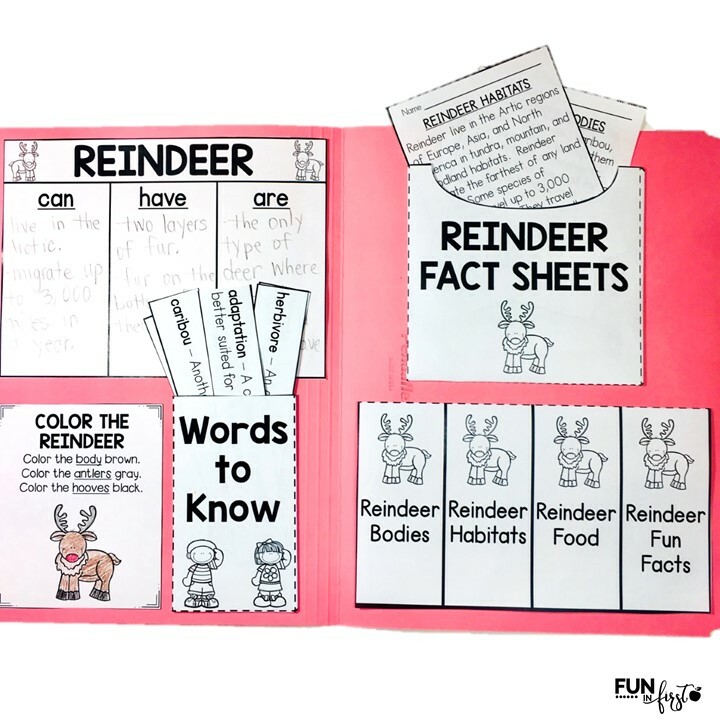 Have students complete the graphic organizer and glue it into their Fact Folders. Pass out the vocabulary words. Go over these together. Have students cut them out and place them in their Words to Know Pocket. Day 5: Review all of the information they learned throughout the week about the topic. Pass out the Writing Page. Students use their resources from the Fact Folder to write about the topic. Then, they cut it out and glue it onto the back of the folder. When I created these, I knew that they would be a great resource for my students. However, I’m always pleasantly surprised in how much ownership they take in these and how excited they are each time to take them home and share with their families. 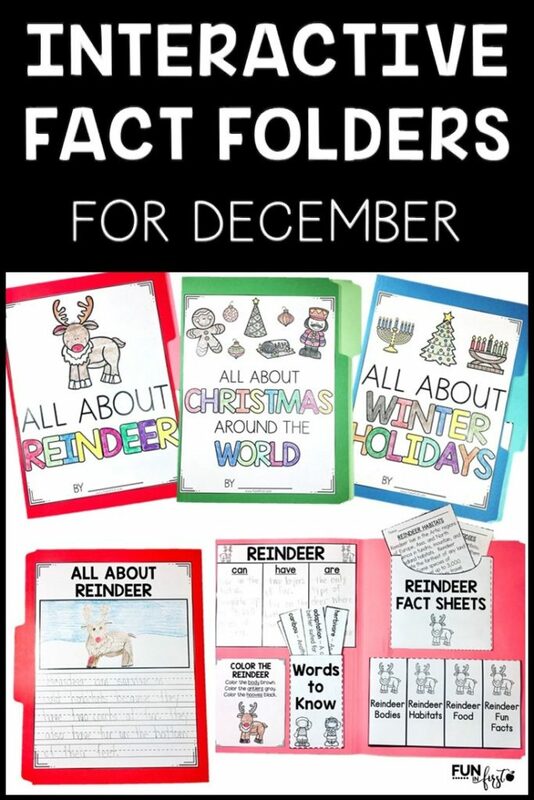 I have created a Winter Holidays, Christmas Around the World, and Reindeer Interactive Fact Folder. They are all included in the December Bundle. Each of these can be purchased separately, or you can save money by purchasing the bundle of all three topics. Which is your favorite December theme to teach? I always do Gingerbread baby and compare with other gingerbread books. i do like your reindeer unit.